The Letchworth Hitchin and District Branch of the Royal Air Forces Association meet at Letchworth Rugby Club Baldock Road SG6 2EN on the third Monday of each month at 1945hrs. A cold buffet is provided on the evening at a small cost to the member. Click on the logo at the bottom of this page to fnd us on Facebook. A chance to pause for a minute in quiet contemplation for our friends and colleagues who have passed away over the last year. Mrs Jean Williams, who was a long time and very active member of the Branch, has sadly passed away. The Spring 2019 edition of our newsletter, RAFAGEN, is available from an option under About on the menu above. We are pleased to share our Annual Report to our 2019 AGM. available under the About menu option. are 10am till 12. To get the info download the details. Roy Newbury who at 90+ is starting to hand over this important duty. memorable day of my 33 years service". Read about Gordon Overton under our Members Mini Stories page. A page linking to our Branch Rules is available under the About menu. On 12 April the Branch celebrated the 100th anniversary since the formation of the Royal Air Force. Bringing together many generations in one place, the Branch enjoyed the company of Serving RAF personnel from RAF Henlow, RAF Honington and JFC Chicksands. Branch Members enjoyed hearing about the next generation of the Air Force. 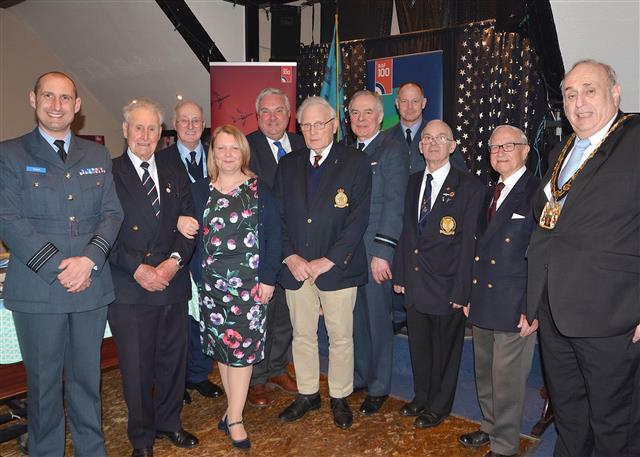 VIP Guests included Wg Cdr Mark Clulo (Stn Cdr RAF Henlow), Sir Oliver Heald QC MP, Ken Needham, Lord Hugh Trenchard (Honorary Air Commodore of 600 Sqn), Air Vice Marshall Alan Merriman and Alan Millard (NH Dist Council Chairman). Wg Cdr Clulo reflected on the 100th anniversary of both the RAF and RAF Henlow, and how important the local community is to an RAF Station Over 50 or so people gathered on the evening, which saw each Branch Member bring an item to display that signified their RAF Service, some brough photos, others a badge or a cap. All in all the evening was a huge success and one which will be remembered for a long time to come. Also at this event our Hon Secretary, Ken Needham, was presented with his award for publication of the best Area RAFA Branch Newsletter for the year. Ex-RAF Flight Lieutenant and WWII veteran Eric Michel was born Christmas Day 1920 and is 96 and half (his words) at the time of writing, he shares a birth date with the Branch RAFALO Warrant Officer Shaun Griffin, though admittedly Shaun was born some 48 years later. Eric's daughter Jackie had approached the Branch stall at Letchworth Armed Forces Day in 2017 to speak about her father Eric who was already known to the Branch, but he had drifted away over the years. She was interested about exploring the RAFA befriending scheme to see if Eric could become one of the schemes recipients. So a link was made and a friendship begun, Eric now has a close link with today's Air Force and RAFA and talks about his time in Burma, India and Canada frequently. As more information began to come to light I decided to write down some of Eric's memories and recollections. With the help of some notes that he himself had made in 2010. I then asked his permission to make them public and for prosperity and to mark this gentleman's Service I'll attempt to summarize nearly a whole century, a life time almost. Born in Hackney in December 1920 the third of four boys to parents William Henry & Elen Louise, he lived in a London slum for the first 10 years of his life, the location of those former slums now house the grand Olympic Stadium. His recollections are of a fun childhood making soapboxes on wheels andof school trips to Chingford. A move to Walthamstow after ten years still didn't see their house having a bathroom, but it did have an inside loo. War broke out 3 September 1939 and Eric cycled a week later from Walthamstow to Romford to join up, he was then aged 19. His first attempt to join the Royal Air Force failed when the recruiting Sergeant turned him away, Eric was fully employed and at the time and the full horrible effects of the war were yet to be felt by the Armed Forces. The following year about 6 months later he was successful and was accepted as a trainee pilot he reported to RAF Uxbridge and was on 3 bob a day. He had to improve his mathematics to continue his training and enrolled in college proving Pythagoras Theory to prove his academia. Finally he was sent to Fairoaks Flying School near Woking in Surrey, where an unfortunate incident in a Tiger Moth while still on the ground saw Eric removed from flying training. After considering Navigator and Bomb Aimer training, he decided that he lacked "air sense" and opted to become an RAF Dispatch Rider instead. After training at Weeton and Pocklington which were Wellington Bomber and Lysander flying stations he eventually ended up at Luton Hoo an English Country House in Bedfordshire billeted with the Army. After promotion through AC2 to Corporal (on pay of four schillings and sixpence) he finally decided that during the winter of 1941, it was too cold on a motorcycle, so applied and was accepted for RAF Navigator training and reported to Regents Park to begin the next phase of his RAF career, one of becoming RAF Aircrew. His journey took him to Canada to complete his training, where eventually and after another failed attempt to become a pilot he undertook Bomb Aimer training in Dafoe Canada, and was now commissioned as a Pilot Officer. On or around D Day he moved back to Blighty via New York and Scotland ready for embarkation to Bombay in India via the sea. Landing at Worli near Mumbai then via train he arrived at Salbani part of West Bengal. Here he joined Number 355 Sqn who were flying Liberator Aircraft. After receiving more training on American bomb sights they were sent on operations. Given targets on the Burma - Siam railway. Here Eric recalls very clearly a raid in which he was the third of four Liberators, the designated target was obscured by cloud so the lead aircraft opted for the secondary target of the railway, as the leader closed at low level to bomb a train stationary at a station a Japanese Ground Gunner hit the liberator and it shot it down, there were no survivors. The second Liberator of their formation also pressed home their attack, he too met with a sad fate but slightly luckier escaped with just two engines working. This plane was later landed at Chittagong in Bangladesh. Eric's Liberator was successful in silencing the Japanese Gound Gunner and pressing home their attack. They escorted the second Liberator part of the way to Chittagong before breaking away to land back a Salbani safe. He still recalls the pilot Flying Officer Cyril King and thanks him and God for getting them home on a wing a prayer that day. Eric was de-mobbed in 1946 and owned 2 grocery shops in Baldock, he lived near Cambridge for while, he owned BSA Goldstar and a Triumph Triple Speed motorcycles, but was a fair weather rider, he always wanted a MG sports car, but never owned one. He was a member of both Letchworth and Baldock Branches of RAFA, this was when the Letchworth Branch would meet in the 3 Horseshoes Pub in Norton. 355 Sqn motto: Liberamus Per Caerula (We liberate through tropical skies). Pictures of 355 Sqns crest and Eric in Canada circa December 1943. It is with deepest sorrow that we have to announce the death of Gordon Overton. Gordon was, for many years, our social secretary along with the late Jean Williams. The two would arrange arrange quiz nights, our branch evenings and outings to various places. Coincidently, it was Gordon and Jean who organised the first branch visit to Cosford Military Museum. After standing-down from the committee, Gordon continued to be a regular visitor to branch meetings until ill health took over. He moved into a local care home, were he was visited by members. A regular visitor was our RAFALO, Shaun Griffin , who brought Gordon along to our day out at Shuttleworth. Although wheelchair bound at the time, I know that Gordon enjoyed himself, being with his friends of RAFA again.